Del Frisco’s Double Eagle Steakhouse in Las Vegas offers elegant dining just steps from the famed Vegas Strip. 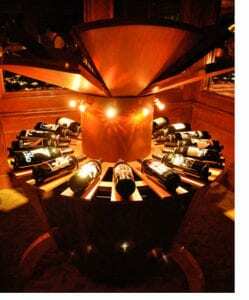 One of the most unique features of this 5-star classic Las Vegas establishment is the James Bond Wine Table. Purchased in 1997 at a Napa Valley wine-auction for $362,000, the table at the steak and seafood eatery is now valued at well over $1 million. At the push of a button, an unassuming circular table blossoms open to reveal lights and 18 custom wine bottles, set to James Bond theme music. 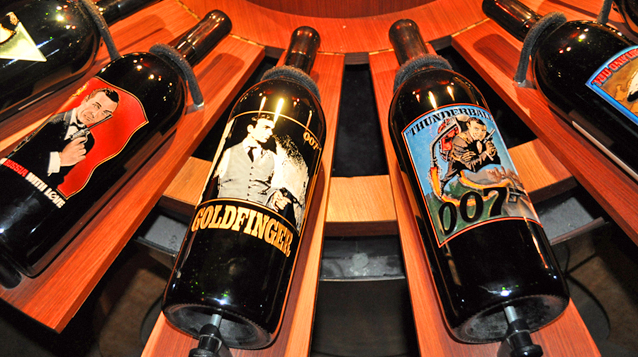 Each wine bottle is etched by hand to represent one of the James Bond films, from Dr. No through Tomorrow Never Dies. Just ask the hostess for a demonstration of this wonderful, one-of-a-kind tribute to James Bond and fine wine!